True story of the doctor who considered it was not immoral to search for a drug that would cure syphillis. The Devil arranges for a deceased gangster to return to Earth as a well-respected judge to make up for his previous life. When retired racket boss John Sarto tries to reclaim his place and former friends try to kill him, he finds solace in a monastery and reinvents himself as a pious monk. On a Sunday, Eileen Tyler, still a virgin, leaves Albany to visit her airline pilot brother in New York but a chance encounter with a man on a city bus threatens to derail her upcoming marriage to boyfriend Russ. Jug Martin: Weepy, I don't like the idea of going into a bank through the front door. Hysterical madcap fun. 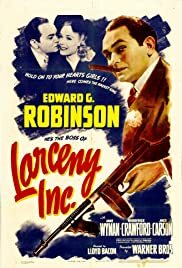 There may be no funnier moment in the history of film than Edward G. Robinson irritably gift wrapping a piece of luggage (all reasonably priced at $9.75) for a bothersome customer. The pacing of this movie is breathless (it's like a Bugs Bunny cartoon) and it's one of the few comedies that can legitimately claim to have a laugh virtually every minute. It's a movie that understands how funny a single door constantly opening and closing can be, provided there is a parade of zany enough characters passing through it, all of whom possess impeccable comic timing. It's also got a young, menacing Anthony Quinn to give it some edge, and an early Jackie Gleason to steal a couple scenes. Nearly as delightful as the king of screwball comedies "Bringing Up Baby".